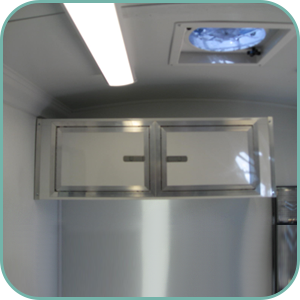 UGroom trailers ship everywhere in the US and are designed to work in all climates: Heat and Cold. Designed with the groomer in mind UGroom trailers make the groomer's job easier with hydraulic tables, waist height tubs and handy outlets and conveniently located equipment. All of our salons also include an exterior warm water bathing option. Our trailers are also designed for equal weight distribution: front to back and side to side. Custom Size trailers are also available. Easy to clean, sanitize and maintain Transit Flooring make it slip resistant, commercial grade and nearly indestructible. Choice of colors available as an upgrade or neutral Gray is the standard included to help hide dirt and "ghost footprints." Waterproof Fiberglass Reinforced Plastic walls are pebble finished to minimize the electrostatic charge created when drying and grooming and therefore are easy to wipe and keep clean from dog hair. dampness. 30 year warranty from rotting for the sub floor from the trailer manufacturer as well.